My girls have all the Little House on the Prairie Books. And they've devoured them, to the point that the books are losing covers and pages are quite ragged. My boys ... not so much. Actually, not at all. I don't think any one of them, much to my dismay and not for lack of prodding, had ever picked up a Little House book. When given the opportunity to review Almanzo Wilder: Life Before Laura, a documentary DVD produced by Dean Butler (you know him, he's the cutie who played Laura's husband on Little House on the Prairie) and Legacy Documentaries, offering insight into Almanzo Wilder's life when the Laura Ingalls Wilder book Farmer Boy was written, I jumped at the chance. My hope was that after viewing the DVD the boys would be unable to resist reading the book, which would then lead them to read all the Little House books, which would then lead them to read every book in the house. Not too much to hope for, right? Almanzo Wilder: Life Before Laura is a documentary. It shares bits of some of the stories in Farmer Boy. More than that it expands on the book, presenting real world information about life when the book was written and the family it was written about. For example, Farmer Boy talks about what Almanzo and his family ate, the DVD shares information about what foods were available and why Almanzo's family ate as they did. The movie is very pretty. It is set largely at the Wilder homestead in New York (which we've added to our "places to visit" list). Both original footage and re-creations are used to enhance the story telling. The DVD is also narrated by Dean Butler, the actor who played Almanzo Wilder on Little House on the Prairie. In addition to Life Before Laura the DVD offers a video tour and information about the beautifully restored Wilder Homestead. Kaden said, "I liked the movie because we got to learn about about the book. Almanzo Wilder was a farmer who wanted to teach Morgan horses. His father didn't trust him with the horses." "I liked it because we learned how life has changed in the past 150 years," said Adam. According to Mia, "I thought that the movie was very informative as to Almanzo's life at that time. It spoke a lot about the history of his life and history that was left out of the book. The movies says a lot about parts of the book that some people might not understand." So ... did it work? Did the boys run to read Farmer Boy and every other book in the house? Well ... sort of. Kaden was very interested in the book and wanted to read it. BUT Mia got to it first and he had to wait until she reread it! Once she finished he picked it up and devoured it and enjoyed it very much. He has since started the Little House series from the beginning. Adam, on the other hand, liked the movie very much but didn't jump to read the book. He says he'll read it "soon". 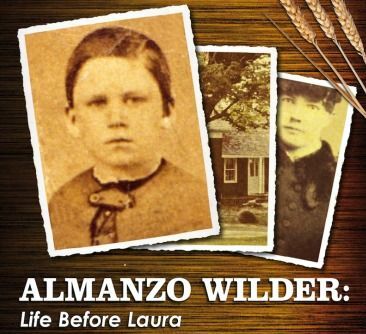 Almanzo Wilder: Life Before Laura is available through Legacy Documentaries for $21.95. The DVD is geared towards kids ages 8-13, however I enjoyed it as much as the kids and would suggest it for all ages.